The Night Garden – Dig Delve – An online magazine about gardens, landscape, growing & making. The two best times to look at the garden are to either end of the day. I would be up at four if I had the reserves, but we are up early when the light is soft and before the sun reaches over the hedge. The stillness of first thing is particular for the feeling of awakening, but there is a charge in the air with the day waiting to happen. When the sun breaks the spell, everything changes as the light flattens and the tasks of the day take over. We wait then until the sun dips low in the sky and the light is softened before resuming our observation. The long evenings are remarkable in this country and particular this year for the brilliance and stillness of this summer. Evenings were always the time that I used to go down the garden at Hill Cottage to the pair of borders that my father and I made there when I was a teenager. His planting to the left in a border of whites and blues and mine to the right with yellows and clashing magentas. We would spend an hour or so talking things through, observing how things could be bettered or moments where briefly things sang. We would talk about the way the colours changed as the light dropped, the blues beginning to pulse and hover as the low light favoured them, and of the way that the brighter, hotter colours, which had flared during the day, dropped away first. Huw and I do the same here, using the time when you can see best to workshop the planting and to enjoy the elements that have come together or shifted during the day. The slow evenings are in our favour, for they have an altogether different charge from the awakening of dawn. We let the colour go through its metamorphosis, as the reds, pinks and oranges heat up at sundown and then quickly dim to almost nothing. 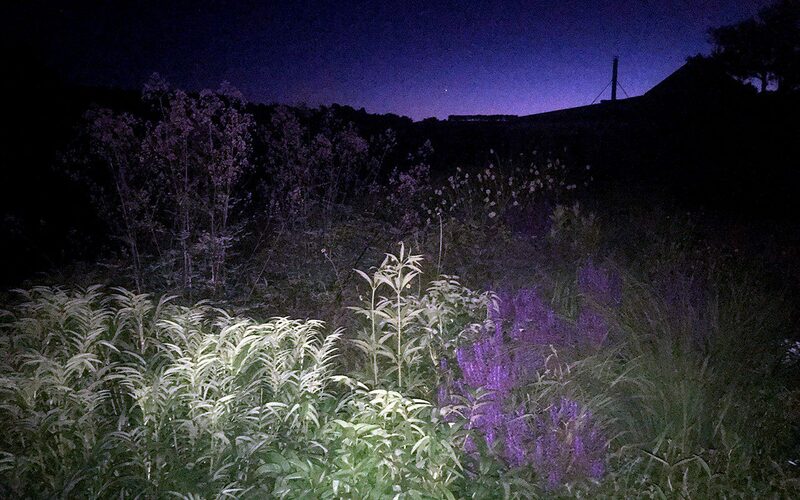 The violet end of the spectrum then takes over as the gloaming hour assumes its residency, the flowers with the most blue in them appearing to lift from their material origins in these fugitive last minutes. Then, in a shift that you feel but do not necessarily see, the colour is gone and you are left with something else. A garden of textures and form, readying for night. More often than not it is ten before we have even begun to think about supper. It is hard drag yourself inside when your senses are retuned and receptive. 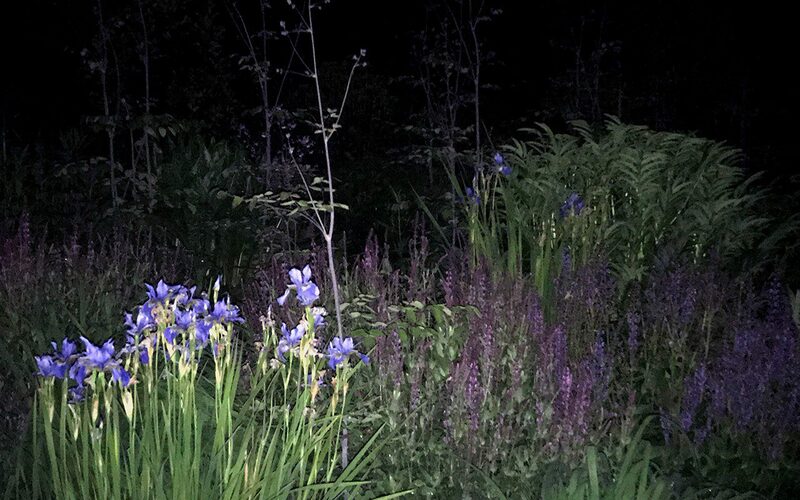 This summer, as much out of desire as necessity, Huw has been photographing the night time garden to extend our experience. I will let him take it from here to explain why. Over the years I have always experimented with my photography. Capturing movement by shooting digital film on a very slow shutter speed and then extracting single frames, selected for the painterly composition of their colour blur. On my old Polaroid camera I would cover the focus sensor, so that images of plantings resembled Impressionist paintings or colour fields. And I have used torches, lanterns and flash to see the garden in a different way by night. With each approach I have been happy, even seeking, to surrender some of my control over the final image to the equipment and technology itself. However, over the past few years, and so that we can record the garden here properly, I have been actively working to improve my skill with a digital SLR camera and a number of lenses, so it has been a while since I have experimented in this way. At the beginning of June, with the start of the long warm nights, I found myself in the garden at the gloaming hour, having driven down to Somerset after a working day in London. With the warmth, growth had started in earnest and, as the light faded, there were parts of the new garden that it fast became too dark to see clearly. I got out my phone and switched the light on. Suddenly individual plants were thrown into sharp relief against the inky background of hedge, wood and sky. The composition of volumes and heights and the differences in textures became more apparent. Colour was heightened and where, by daylight, the plantings were soft and transparent, now they were graphic and architectural. I immediately started taking photographs on the phone with the flash. It is a tricky process framing and composing an image when you are, quite literally, shooting in the dark. A series of test shots are necessary to establish the composition and to attain the right distance from the subject so that the flash doesn’t create too much of a hot spot. Even once this has been successfully done, the camera doesn’t always focus accurately in the dark, so each successful shot is arrived at after taking many that do not work. It is then a long process evaluating, editing and then adjusting contrast and colour balance to achieve a satisfactory result. As the nights grew longer and we wandered the paths later and later each evening, I have been staying out after nightfall to try and capture aspects of the ever-changing picture. As in Tom’s Midnight Garden, the clarity of darkness reveals things invisible by day. The abstraction of the plantings against the velvet black and the fluttering of a thousand moths making of the garden a new mysterious and magical territory.